Hair transplant is the best way to regain lost hair and lost self-confidence. But it can be hard to be discreet about it and get it done without people noticing. It is especially an issue for people who have to get back to work in a few days after surgery, but want to hide it from their colleagues or bosses. There are ways to conceal the fact that you have had surgery, but before that it is important to understand the recovery timeline. Immediately after the procedure, there is some redness and scabbing on both the donor and the recipient areas from the extraction and transplanting. The redness takes a couple of days to go, while the scabbing over the grafts falls out in about 7-10 days. There is also some mild swelling around the forehead in the first week after surgery. The swelling usually starts about 24 hours post surgery at the hairline, and will move down the forehead, and to the nose and eyes. The swelling can stay for 3-5 days. The surgeon will also shave off hair on the donor site, which is the rear and sides of the head, where hair follicles are extracted. The hair that is not harvested on the donor site should start growing back in a week of surgery. 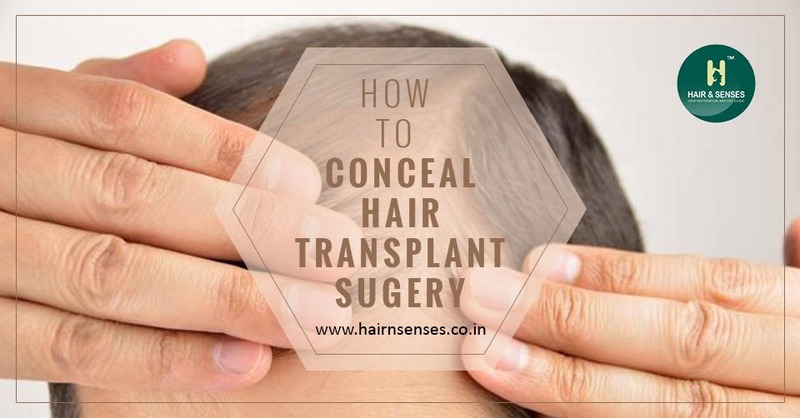 The sutures or surgical staples are usually removed after about 10 days in case of FUT, while the shedding of the transplanted hair starts around the third week, and it will extend to about 3-4 months. Post-transplant shedding is absolutely normal as the hair grafts go through a dormant or sleeping phase. New hair usually starts sprouting 10-12 weeks post the procedure. The best way to stay discreet about a transplant is to take some time off work. A period of about 2 weeks can be useful for a patient as by that time the redness, swelling, and crusting will dissipate, and the grafts will have settled well into the scalp. Although it is understandably difficult to take that much time off work, but there are other ways to help make the transplant less obvious. b. Some amount of crusting can be avoided if the hair is washed regularly in the days following the surgery. Although a gentle shampoo should be used, the patient has to be careful while washing and not scrub too much as that may dislodge the grafts. c. To avoid swelling, patient should sleep with head in upright position. The use of cold compress also helps in reducing swelling. Basically, meticulous post-operative care can help with the swelling significantly. d. The shedding phase post the hair transplant can be very difficult to hide as well. But there is a solution available in the form of nano-fiber products that blend in with natural hair. In fact there are various cosmetic camouflaging products available in the market that can hide hair shedding and hair thinning. These products can cover the affected areas of the scalp and add volume to whatever hair is left on the areas with thin hair. While all these methods can help conceal the transplant, but a good surgeon can ensure that the procedure is done in way that the grafts are not over harvested or wasted unnecessarily, and the extraction and transplanting of grafts is done causing as minimal a stress as possible to the surrounding hair.